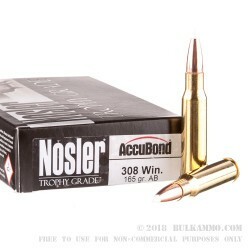 Nosler .308 Winchester rounds feature a 165-grain AccuBond projectile, loaded into boxer-primed, noncorrosive reloadable brass cases and is capable of a muzzle velocity of 2800 FPS, while maintaining a speed of 1917 FPS at 500 yards. 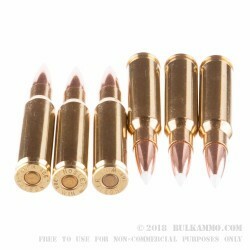 These rounds are ideal for deer and similarly sized game even at long range. The AccuBond projectile features a polymer tip, loaded into a tapered copper alloy jacket and after going through the exclusive bonding process allow for maximal weight retention and expansion upon impact. The polymer tip initiates expansion, while the solid base design makes it easier for the bullet to mushroom after impact. 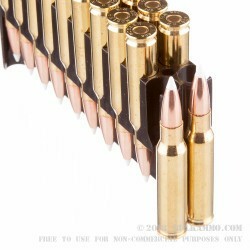 Each box of .308 Winchester from Nosler contains 20 rounds. 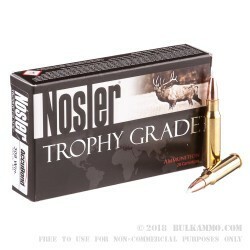 Since 1948, Nosler has created quality hunting ammunition for hunters and match shooters. After failing to take down a moose in 1946, John Nosler vowed to create a consistently-performing hunting round. This round would eventually become the Nosler Partition, the first in a long line of Nosler innovations. Offering a wide array of product lines, Nosler continues to be a leader in accurate hunting and match ammunition.